World 8- Bowser's Castle is the eighteenth and final course of World 8, and the final course in the game. It is a Bowser Castle level with various tower and castle enemies with a boss fight with Bowser at the end (if the player has recruited Bowser by clearing this course once, Boom Boom is fought instead). When the player defeats Bowser, he summons the Koopalings and Bowser Jr. to join him for the final battle in a multicolored void (which counts as the same course). Clearing this course once unlocks Bowser and Peach as Helpers, harder, Special World versions of the eight worlds, and the first upgrade for the Lucky ? Blocks spot at Toad Houses. Bowser, the final boss in the game. This level is straightforward and has eight battles: the first battle has a Big Bony Beetle; the second has a single Chain Chomp; the third, a Thwomp; the fourth, all five Magikoopa types; the fifth, a Big Bone Piranha Plant; the sixth, two (or three) Chain Chomps; the Whomp for the seventh; Thwomp & Thwimps for the eighth, with a boss fight with Bowser at the end. Bowser, the Koopalings and Bowser Jr., in the final battle. 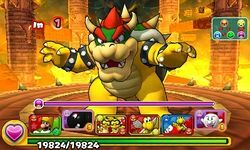 When the player defeats Bowser in the course, the Koopa King summons the Koopalings and Bowser Jr. for the final battle. The player then "reenters" the course, taking place in a multicolored void. With all the Koopalings on the Clown Car alongside Bowser, the group is named Bowser and His Minions and is treated as a single enemy, with Bowser Jr. being separate. 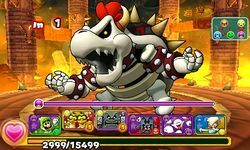 The battle starts with Bowser Jr. casting "Attribute Buffer", reducing attribute damage for the entire group for 99 turns. If Bowser Jr. is defeated in the middle of the battle, "Bowser and His Minions" will sometimes cast "Junior Rebounds", bringing him back to the battle at full health. "Bowser and His Minions" and Bowser Jr. can both use "Bind Attack", binding one of the player's teammates as well as inflicting damage. 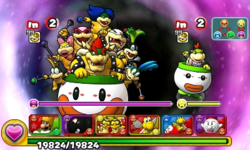 Bowser Jr. can also use "Support" to cause partial blindness on the player's Orb field; "Healing Magic" to heal a significant amount of HP to the entire group and reduce damage from an attribute for three turns; or "Refresh Attack", which resets the player's entire Orb field. 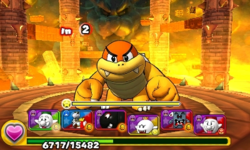 "Bowser and His Minions" can use "Bowser's World", an attack that deals a heavy amount of damage as well as neutralizing any status defects for the entire group; "Attribute Change", a move that changes the attribute of itself as well as inflicting damage; and "Bowser Breath", a move where all the Koopalings charge up and fire their wands and Bowser breathes a fireball in tandem for a combined attack that deals heavy damage. "Bowser and His Minions" drops a Spiky Shell upon defeat. Once the player defeats the final boss, and Bowser joins the player's party, the final battle cannot be played again. 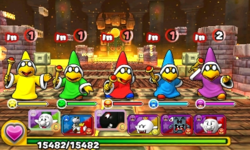 Also, "Bowser and His Minions" + Bowser Jr. is the only enemy who can't be recruited at all. The player earns an additional 6192 XP and 40 Coins for every time they defeat Bowser Jr. in the final battle. Dry Bowser, the true final boss in the game. ★World 8- Bowser's Castle is a difficult version of World 8- Bowser's Castle from ★World 8, with different enemies for most of the battles: the first battle has a Boomerang Bro, a Fire Bro, and an Ice Bro; the second has three Bob-ombs; the third, a Big Bone Piranha Plant; the fourth, all five Magikoopa types; the fifth, a King Bill; the sixth, a Cheep Chomp; Chain Chomp & Flame Chomps for the seventh; and Thwomp & Thwimps for the eighth. The player faces Dry Bowser, instead of his living counterpart for the boss, but after Dry Bowser joins the player, he gets replaced by Boom Boom for this course's boss. Dry Bowser drops a Grand Spiky Shell upon defeat. The Orb configuration for this Special World course matches that of its normal world counterpart. Clearing this course once unlocks Dry Bowser, Super Peach, and Bowser the Koopa King as Helpers. Boom Boom, replacing Bowser as the boss of World 8- Bowser's Castle. This page was last edited on November 24, 2017, at 23:03.